Weight loss is a common fitness goal with a variety of techniques designed to maximize results. Some techniques utilize weight loss supplements or nutritional drinks during different phases of the weight loss program. The best nutritional drinks complement an exercise routine while promoting healthy weight loss by providing essential nutrients, vitamins and minerals. The best nutritional drinks for weight loss can be used in a variety of ways, such as meal replacement shakes, post-workout protein drinks or a snack. 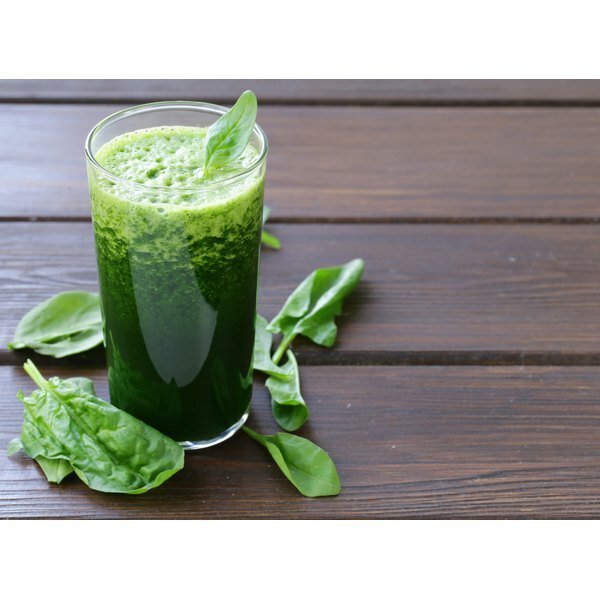 The overall goal of the nutritional drinks is to complement a well-rounded weight loss program that includes exercise and a balanced meal plan. Commercial nutritional drinks such as Slim-Fast or Ensure can serve as an easy on-the-go weight loss drink, but homemade recipes can be customized to meet your individual nutritional requirements. Calorie breakdowns in nutritional drinks primarily are from protein and carbohydrates, with a small percentage coming from fat. Slim-Fast French vanilla shake, for example, contains 180 calories per serving with 10 g of protein, 23 g of carbohydrates and only 6 g of fat. Carbohydrate content typically includes a significant amount of dietary fiber that helps to curb appetite. One Slim-Fast shake contains 5 g of dietary fiber, which supplies 20 percent of the daily recommended intake. Nutritional drinks will start with a liquid-base such as skim milk, fruit juice or water as the primary ingredient. Milk and fruit juice provides essential vitamins and minerals without adding a significant amount of calories. A protein concentrate will supply essential protein and will be sweetened with artificial sweeteners to avoid excessive carbohydrates and calories. Additional ingredients include vitamins and minerals. The best nutritional drinks for weight loss will include essential vitamins and minerals that promote healthy body functions and allow the drinks to be used for meal replacements. For example, Slim-Fast French vanilla shake contains more than 20 vitamins and minerals. One shake provides 100 percent of the daily recommended intake for vitamin C and vitamin E along with 50 percent for calcium and phosphorus. Other vitamins and minerals include potassium, vitamin A, vitamin D and iron. According to Katherine Zeratsky from the Mayo Clinic, nutritional drinks and protein shakes can promote weight loss, but the key to losing weight is burning more calories than are consumed. Use the nutritional drinks to complement an exercise routine and diet plan consisting of a variety of fruits, vegetables, whole grains and lean protein.